India Geography boasts a unique terrain and diverse regional climate. The geography of India includes snowy mountains, vast open plains, dry hot deserts and beautiful beaches. India boasts one of the world's most diverse land layouts. The central northernmost border of India and Northeastern India is defined by the majestic Himalayan Mountain Range. Himalaya is a Sanskrit word that means "abode of snow", which is fitting because these tall mountains are snow capped and reside in a tundra climate. The Himalayan Range separates India from the Tibetan Plateau, where India's borders to Bhutan, China and Nepal are located. It's part of a larger mountain system that includes the Karakorum Mountains and the Hindu Kush mountains. The collected Himalayan Mountain System sports the world's highest mountain peaks, such as Everest and K2. There are more than 100 mountains that exceed 23,600 feet in height. Everest is one of the absolute tallest at 29,029 feet. Many of the Earth's most important rivers spring directly out of the Himalayan Mountain Range. These include the Ganges and Indus Rivers, the Yangtze, Salween, Mekong, Red River, Xunjiang, Chao Phraya, Irrawaddy River, Amu Darya, Syr Darya, Tarim River and Yellow River. 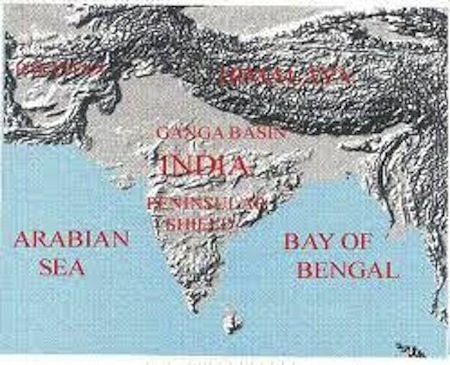 India geography and topography includes a huge number of river systems. The Indus River is extremely important to India geography and history because it was along this river that the first Indian people emerged in the Indus Valley Civilizations, such as Harappa. The combined drainage basin of these rivers supports approximately three billion people; this is roughly half of the Earths population that live in the countries of India, Bangladesh, Bhutan, People's Republic of China, Nepal, Burma, Cambodia, Tajikistan, Uzbekistan, Turkmenistan, Afghanistan, Kazakhstan, Kyrgyzstan, Thailand, Laos, Vietnam, Malaysia and Pakistan. The Himalayan Mountains have played a role in shaping the culture of India, as well as South Asia's culture because many Himalayan peaks are considered sacred in the religions of Buddhism and Hinduism. The northwestern region of India borders Pakistan in two important areas, the Punjab Plain and the Thar Desert. The Punjab Plain is located in the northern Punjab Region of India. It encompasses two distinct areas, the Punjab Plain itself and the Shivalik Strip. The Shivalik Strip refers to a hilly area made up of clays, silts and conglomerate rocks in the region of India that outlines the bottom of the Westerly Himalayas. This hilly area is called the Shivalik Hills, and it is rich in deposits that it collects from the many rivers and streams that run through this region. Basically, the Shivalik Strip is the separation point between the Western Himalayas and the Punjab Plains, which makes it a defining section of India geography. Just west of the Shivalik Strip is the Punjab Plain. The Punjab Plain includes the states of Punjab and Haryana and is vitally important in agriculture of India Geography. It's also the western part of Pakistan's Northern Plain, which was formed by the Indus River, and its related river systems. A lot of cereal and cotton is grown here due to the loose, mineral rich soil that was created by deposits of the river systems. This vast Plain measures at roughly 35,000 square miles, making it one of the most fertile land areas named in the geography of India. The Thar Desert is sometimes referred to as the Great Indian Desert. Based on India Geography, it lies just southwest of the Punjab Plain and is the second part of India's land structure that shares a border with Pakistan. As you may have guessed, it's a vast arid region in India's Northwest region; it covers more than 90,000 square miles and ranks as the seventh largest subtropical desert in the world. It is basically impossible to discuss the geography of India, without mentioning the Thar Desert. The Thar Desert is mostly located in the Indian State of Rajasthan, but extends northbound to the southern parts of the Haryana and Punjab states, and into the northern part of the Gujarat state as well. This desert is especially important in the ancient history of India because, thousands of years ago, the Mohenjo Daro and Harappa cultures emerged here as two of mankind's first human civilizations, started Ancient India Culture. As you read through more about Indian culture, you will be able to clearly understand how India geography played a role in the culture. 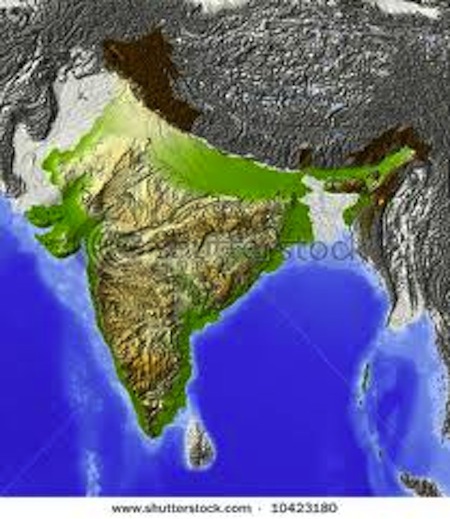 Leave India Geography and topography to visit the main geography of India page. Explore more of India from our homepage.